They say death and taxes are the only two certain things in life. Alas, this wasn’t always the case. Well, at least for the income tax. Following the revolt against the British, a federal government was elected and the fun began. This “fun” inevitably led to the situation where not everyone could agree on what the United States should stand for, much less what laws should be enacted. As a result, there was no federal income tax for nearly 100 years. Ah, the good ole days! If there was no income tax during this period, you are probably wondering how the government functioned. It did so by collecting use and sales taxes. Taxes were charged on liquor, tobacco and imports to mention just a few. Many people in our modern society would like to return to just such a system. Contrary to popular notions, the first income tax was not put into law in the early 1900’s. In fact, the first President to institute an income tax was Abraham Lincoln. In 1861, President Lincoln and Congress passed an income tax law to assist with funding the Civil War with the south. When the war came to an end, the tax was phased out. Imagine a tax being phased out now? That should bring a tear of laughter to your eye. 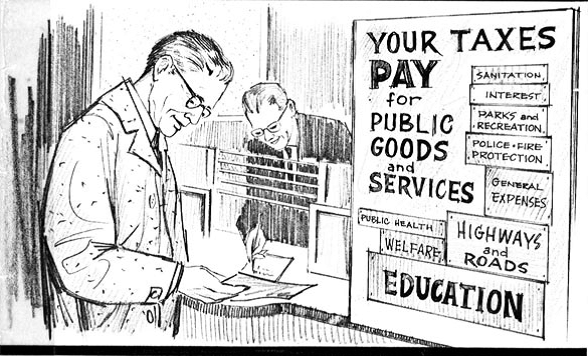 The income tax as we know it was first instituted in 1913. Congress passed a law establishing a graduated tax rate of one to seven percent on all income taxes. I can say honestly and truthfully that I would kill to pay one percent in taxes these days. Heck, I am willing to take on the burden of paying seven percent! In establishing the income tax system, the Constitution was amended to add a 16th Amendment. This Amendment gave the federal government the right to collect taxes. The politicians primarily responsible for this were President Roosevelt and President Taft. I mention two Presidents because the bitter debate over the subject took some time to work out. If you’re looking to blame a particular political party, Presidents Roosevelt and Taft were both Republicans. Of course, the Democrats haven’t exactly made much of an effort to repeal the tax, so both parties deserve a whack upside the head in my opinion. Nonetheless, this is how we came to be burdened by the income tax in the United States.